At the end of March, the Certified Guaranty Company announced the release of a brand new state-of-the-art holder that will be used to encapsulate all comic book submissions beginning the 4th of April, 2016. Managing to incorporate the most advanced archival materials, the redesigned, patent-pending holder improves upon CGC’s original holder with a sturdier construction and new crystal-clear display that offers superior optical clarity. Research and development of the second generation holder, which spanned over three years, was orchestrated by Matt Nelson. “Our thorough development process included six months to solve the dilemma of securing the book without the inner well, so the creative design solution was a real breakthrough”, said Nelson. 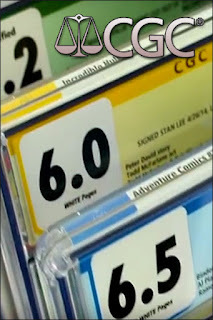 Heat seal lines that were previously visible have been eliminated with the removal of the inner well, further enhancing the visual aesthetic of CGC-graded books. Internally, the new holder contains archival Mylar sheets that have been endorsed by the Library of Congress for the preservation of paper. The new design will accommodate books with overhang and other defects previously difficult to encapsulate. Additionally, frosting along the edges has been removed to allow full visibility of the book’s sides. All new holders will lock with previous CGC holders for safety when stacking. 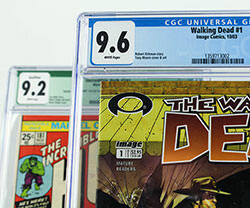 The CGC certification label has also undergone a face lift, resulting in a more modern design that better highlights the book’s information. In addition to this, the top label is now encased inside the holder, eliminating the need for a sticker along the outside of the top edge. CGC's Director of Operations Harshen Patel recently said, “This new holder is a quantum leap forward and redefines the standards for preservation and display. The clarity we achieved showcases comics on a level that will drastically change the way collectors view CGC encapsulation”. The launch of the new holder coincides with Nelson’s move from CGC’s sister company, Classic Collectible Services, the world’s premiere comic book pressing and restoration service, to a full-time position at CGC, joining Paul Litch as a Primary Grader and member of the senior management team. “CGC will continue on its current path of innovation, growth, and consistency”, declared Patel. “This holder marks an important milestone in this evolution".